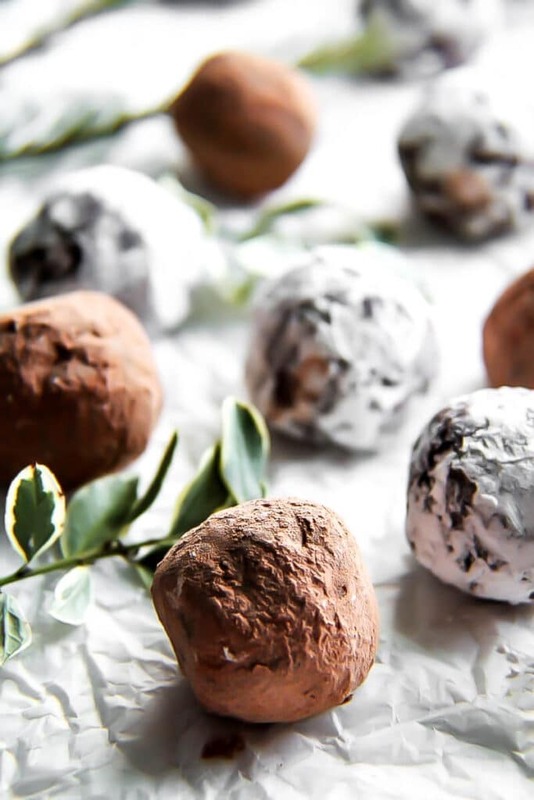 These easy vegan chocolate truffles with Kahlua are a melt in your mouth holiday treat! The perfect homemade chocolate for Christmas, Valentine’s Day, or just your next chocolate craving! They’re vegan, gluten-free, and nut free, yet rich, creamy and delicious! free of dairy, gluten, and nuts! easy to make before the holiday rush and freeze. My mother has been making these during the holidays since I was a kid and they’ve always been one of my favorite holiday treats! They taste like chocolate flavored butter with a hint of Kahlua! The original recipe calls for egg yokes, but I swapped them out for some silken tofu and I can’t taste the difference. Can I make these vegan chocolate truffles without the alcohol? Yes, you can omit the Kahlua and just make them a plain chocolate flavor. (They will be slightly firmer this way). How do I make vegan chocolate truffles? Start with a 12 oz. bag of vegan chocolate chips and some vegan margarine. (Use my homemade vegan butter for the best flavor). 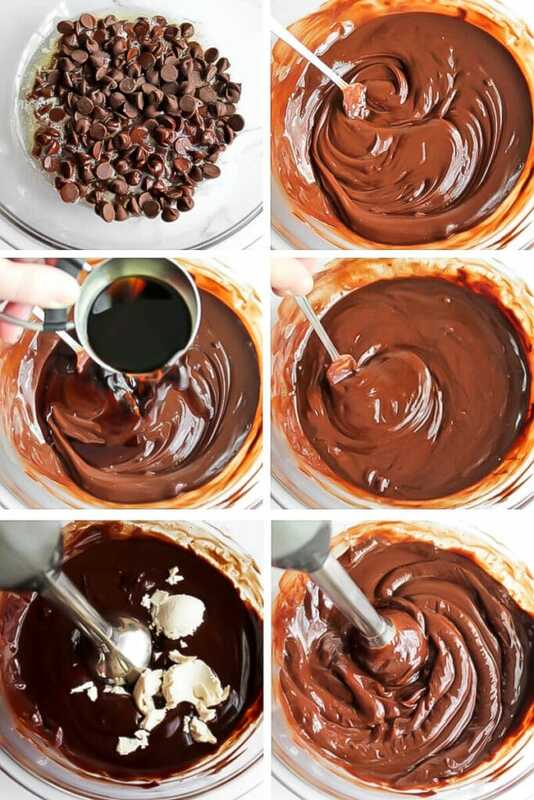 Melt the chocolate chips and butter in a double boiler or put in the microwave for 1 minute and 20 seconds. (Don’t overheat). Stir the chocolate and butter together until combined and then add the Kahlua. Stir in the Kahlua, then add the soft tofu and blend with an immersion blender until creamy. Put in the fridge for at least 3 hours until it’s firm. Prepare a shallow bowl with your choice of powdered sugar, cocoa powder, nuts, or even sprinkles. Once firm, take a walnut-sized piece of the mixture and roll it into a ball with clean hands. Then roll the truffle into the powdered sugar or whatever you want to roll on the outside and set on a piece of parchment paper. Store in a sealed container in the freezer until ready to serve. (They will warm up to room temperature quickly). Serve chilled– these truffles will become very soft if left at room temperature. If you can not find vegan powdered sugar, it is easy to make your own with regular vegan sugar. Check out how to make powdered sugar from Sarah at Sustainable Cooks! Melt the chocolate and butter in a double boiler or put a glass bowl over a pan of boiling water and stir until they become smooth and combined and then remove from heat. You can also use a microwave to melt the butter and chocolate, but do not overheat! Heat on high for no more than 1 1/2 minutes and then stir well. (even if they don’t look melted, once you stir them with the melted butter, they will melt. If you overheat the chocolate, it will burn and become too thick to work with. If you don’t have an immersion blender, you can pour the whole thing into a regular blender to combine and then pour back into a bowl before refrigerating. This is a messy job. Have everything laid out and ready before starting to roll the truffles into balls. Store in the fridge for up to a week or in the freezer for up to 3 months! How should I store these vegan truffles? I love these glass Snapware containers for storing these truffles. They are firm, so your truffles won’t get smashed in the freezer and have a lid that seals airtight, so they stay perfectly fresh. Want to give these as a gift? See my instructions to make cute little candy boxes in my post about homemade vegan chocolates. Want another great vegan treat that you can make ahead and freeze? Try my Vegan Creme de Menthe Squares! 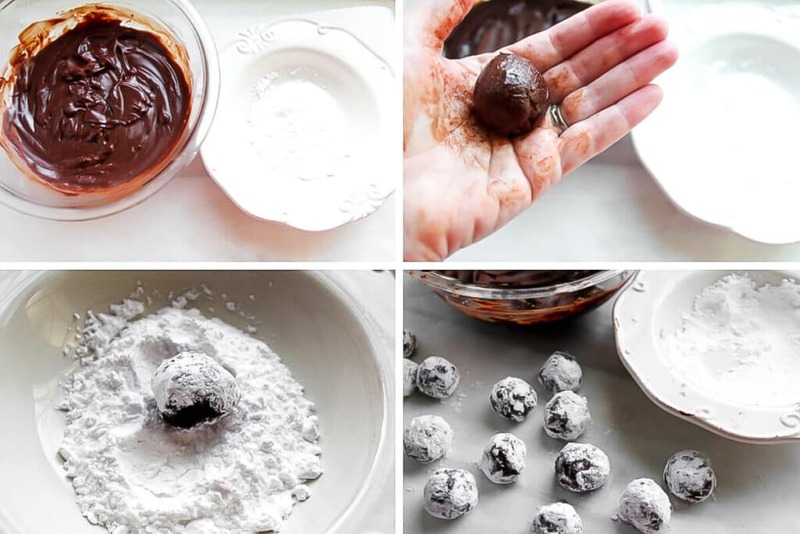 Did you make these vegan chocolate truffles? Leave a comment below the recipe and let me know how it goes! A creamy vegan chocolate truffle with a hint of warm Kahlua. Melt the chocolate chips and butter in a double boiler or put in the microwave for 1 minute and 20 seconds. Put in the fridge for at least 3 hours until it is firm. 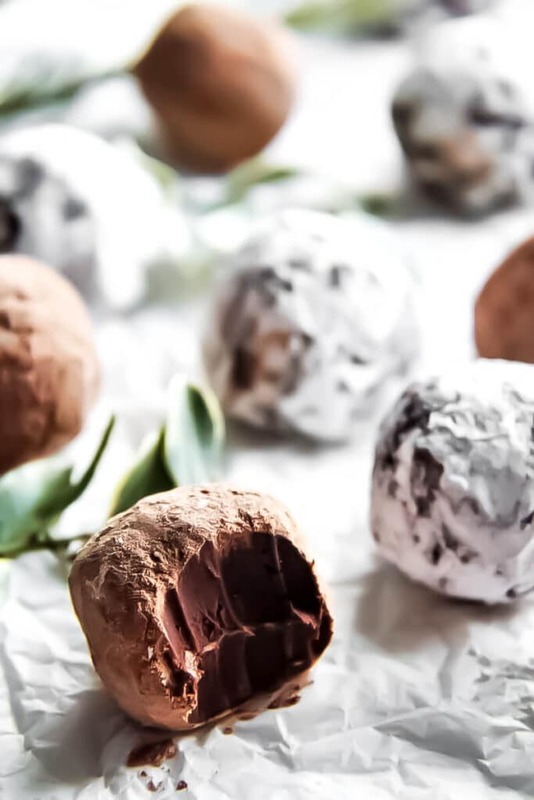 Prepare a shallow bowl with your choice of powdered sugar, cocoa powder, nuts, or even sprinkles to roll the truffles into. Then roll the truffle into the powdered sugar or cocoa powder. You can also use a microwave to melt the butter and chocolate, but do not overheat! Heat on high for no more than 1 1/2 minutes and then stir well. (even if they don't look melted, once you stir them with the melted butter, they will melt. If you don't have an immersion blender, you can pour the whole thing into a regular blender to combine and then pour back into a bowl before refrigerating. I need to buy some Kahlua so I can make these, I have everything else in my pantry. They look so indulgent, I never would have guessed that they were vegan (or that there was tofu inside). We LOVE vegan truffles around here and it’s been ages since I’ve made Kahlua ones. This version looks and sounds delicious! My kids and I made these last night…..so easy. Lets just say that they are gone now! Creamy and delicious!